Use the right tools. Do the job once. You could be losing almost a third of the energy in your home through cracks, gaps and holes in your interior and exterior walls, around your windows and in your ceiling. Air sealing has never been more important or safer to do yourself, and the payoff is huge. If you use the right tools, caulking and foaming are remarkably easy to do. It will probably take you less than a weekend to fill all the gaps and holes within reach, even if there are a lot of them. We're confident that you can get the job done safely, as sealants now contain fewer harmful compounds than ever before. While the vast majority of sealing jobs are easy to take on yourself, some are best left for professionals. Let them take on insulating behind existing walls and in crawl spaces, for example. For the rest of the tasks, just act like a professional, and use the same tools. Like any home improvement job, using professional quality tools and materials means not having to come back and redo the job. In the case of foams and sealants, (unlike, say, peeling paint) poor performance is more than an aesthetic problem--it's an expensive one. Our advice: Do it right the first time and save yourself significant hassle and mess. In the long run, you and your pocketbook will be glad you did. What exactly are the best tools of the foaming and sealing trade? Let's start with foams. Spray foams exploded onto the market a few years ago, much to the delight of owners of old homes who were looking for an affordable and effective way to seal gaps that were too wide to effectively seal with caulk (typically 1/4" or more). As the audience for foams, well, expanded, a few problems became apparent. Foams tended to have high levels of Volatile Organic Compounds (VOCs) and other nasty ingredients, such as formaldehyde. Thankfully, a new generation of foams has come to the rescue, complete with a number of home and earth-friendly qualities. Ideal applications: Insulate around windows, door frame joints, jambs and sills. Seal around electrical and plumbing penetrations. Ideal applications: Fill large cracks and voids such as cavities along rim joists, roof and wall joints, under hot tubs and Jacuzzis, and where walls and ceilings intersect. Ideal applications: Fill gaps, holes and cracks indoors or out, such as around windows, door frame joints, jambs and electrical and plumbing penetrations. As for the guns... Most air sealants (like OSI GreenSeries) require a foam gun for proper application. 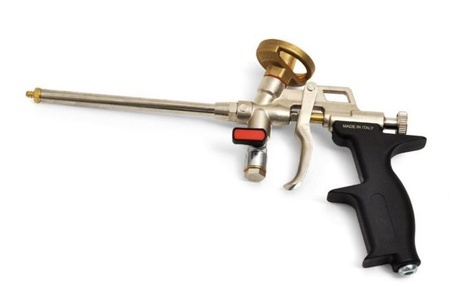 While there are cases where using foam from a can is perfectly suitable (such as spraying into wall cavities), a foam gun is the better choice for control. It's less messy than using spray foam from a can, and it helps you draw a beautiful bead that doesn't require a lot of extra fuss. For applying caulk, it's really worth the money to pay for a professional-grade caulking gun. There's a reason why those el cheapo guns do a lousy job. For one, they don't dispense a bead with even force. That means wasted time and money. A well-made gun like the Newborn Parallel Frame Caulk Gun dispenses caulk evenly, so you can get a tight, beautiful-looking seal on the first pass. What's more, the tube of caulk won't rattle around in the chamber like a soda can in the back of a pick-up truck. While other forms of sealing gaps have more permanence, there are times where expedience rules the day. For situations like these, we recommend Mortite Rope Caulk, which comes in gray as well as brown, and a variety of lengths. Just roll it out, press it into cracks and you're done! Your hands even stay remarkably clean in the process. Need to unseal those gaps in the spring? No problem. The Mortite will peel right back off. Click around our weatherstrips and air-sealing section for more information about individual products, and don't hesitate to contact us if you'd like more information.